When your sensitivity is no longer numbed by negative vibrations from animal food, it is as if a brake to your human potential is lifted: you will (re)discover your natural compassion toward all living beings and stand in awe before the wonders of this world. We all know vicious circles, we even may have experienced them in our lives. These are negative feedback loops, where one negative factor affects a second factor in a negative way which in turn affects a third one and so on until eventually the last or several of these factors reinforce the first one, which again reinforces the second one, etc. ad infinitum. Vicious circles are typically hard to break, because of the intricacy of the factors that are involved. 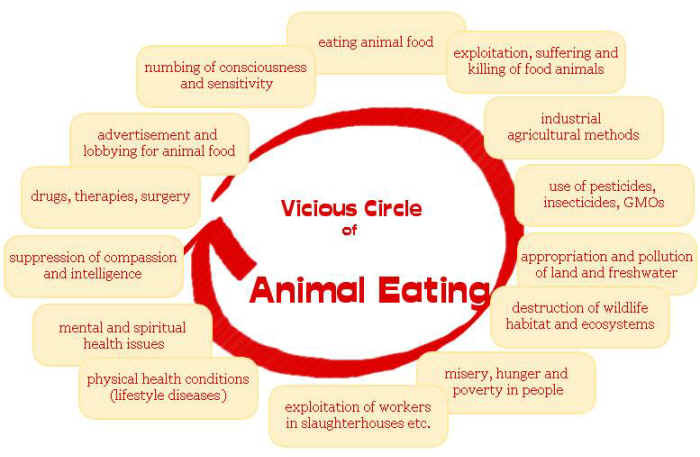 An example of a very destructive vicious circle is animal eating. The first element in this genuine infernal chain of factors is our wish to consume animal products on a large scale: meat, dairy and eggs. This requires the exploitation of food animals in factory farms, feedlots, and slaughterhouses and leads to the necessary invention and practice of industrial agricultural methods including the use of pesticides, insecticides, GMOs and so on. Those industrial practices hunger for land and freshwater which they use and pollute at a vertiginous pace, thus causing destruction of wildlife habitat and ecosystems such as rainforests and oceans. They are also responsible of misery, hunger and poverty in people who are dispossessed of their land and otherwise available food which now goes into fattening farmed animals. The exploitation of workers in slaughterhouses and similar facilities is another effect of the above mentioned industrial farming methods. Physical diseases plaguing mankind come directly from the consumption of inappropriate food – we are not designed to eat animal food and we were certainly never intended to eat genetically modified food, be it of plant or of animal origin, not more than fast food or junk food. They are also the outcome of toxins and drugs used in agriculture and of the low vibrations emanating from animal food because of the pain, frustration and panic implied in farming and slaughter methods. Those negative vibrations are disturbing our mental and spiritual health as well, thus making us prone to violent behavior and self-destruction on an individual and cultural level. On the other hand they suppress our natural compassion and intelligence and prevent us from revealing our true human potential and power. These negative effects on our body, mind and spirit transform us into easy prey for the various drugs, therapies and surgeries offered by the pharmaceutical and medical industry. Through their effective advertisement and lobbying to ensure their profit and position of power, the circle loops back to even more consumption of animal food. Social pressure also works in this direction. But the crucial factor may be the numbing of our consciousness and sensitivity; it is achieved through the vibrational effect of the animal food itself, our intoxication from agricultural poison and legal or illegal drugs, and social indoctrination manipulating us from the cradle to the grave. This numbing allows people to become indifferent to the suffering of other living sentient beings and to simply consume without thinking whom they are eating. And to ignore the many consequences of this. As we can see above, the latter are interrelated in highly intricate ways, which would make it more accurate to speak of a vicious multidimensional web than a vicious circle. Nevertheless it fulfills the criterion that at each iteration loop, the factors are reinforced in a negative way. The good news is: there are virtuous circles, too! These are the exact opposite: positive feedback loops, where one factor influences another in a positive way and is in turn influenced in a positive way by it or by another factor. 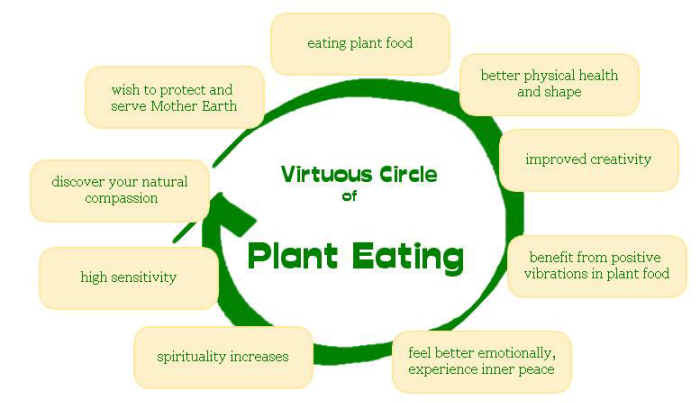 Going vegan is an interesting and easy way to start creating a powerful virtuous circle in your life, and I will explain to you how this works and what you have to do. You do not have to believe me, just try it yourself, you can start today! Or if you have already gone vegan, you may become aware of how much this changed your life on many levels by thinking about the different factors I will mention. I believe it is a general phenomenon that all vegans experience in some way. To keep things simple, I will focus on the changes in your personal life. On a global level, the changes that you undertake in your life lead to transform many factors that can be seen above in the vicious circle of animal eating, too, such as industrial agricultural methods: if those are no longer tolerated by the consumer, they will be modified. But on one hand, these global changes do not become effective immediately, it needs more of us to participate in this peaceful food revolution. On the other hand, though your personal food choices may actually diminish the suffering of some animals, this is not something you could see after a week or two, whereas the virtuous circle I am talking about in this article can be experienced by you directly and immediately. So, let’s say that you decide to adopt a plant-based diet, eating vegetables, fruits, legumes, nuts and seeds etc. What will happen? There will be repercussions on several levels, even levels you are unaware of now. This depends of course on how you “design” your new diet – junk food or wholefoods, conventional grown food or organic food, cooked food or raw food and so on. I will assume that you switch to an organic wholefoods diet with a high percentage of raw food. The benefits that you can expect also depend on the mental and spiritual food you absorb through media, meditation etc. – refrain from violence in all its forms and after a week or so you will start noticing a difference in your way of thinking. Intention is the key in spiritual development and also in food matters: if you decide to be a peaceful and aware person, your way of eating will easily and naturally adapt to this goal and not be a restriction to you. On the most basic level, your physical body will be in better health and better shape. This may not happen immediately, you may go through a period with detoxification symptoms. But you can be completely confident, within 1-2 weeks or so, you are through this, and from then on, you will physically feel better and better every day. Why? Because your body consists of around 100 billion cells and they appreciate being nourished with the right stuff: quality nutrients, important minerals, vitamins, and enzymes to help with digesting – all that is contained in a plant-based diet we humans are designed for. One may object that a so-called mixed or omnivorous diet contains fruits and vegetables as well, and is thus as healthy as a vegan diet. The truth is that in the standard American diet or any other typical diet in Western countries, plants are considered as accessories, called side dishes. Let’s say that a typical meal consists of 300 g food. If you eat 150 g animal products, there will only be 150 g plant food “left” to eat. It is obviously not the same than eating the plain 300 g plant food. I say the same to explain why I prefer eating 100% raw when people tell me that eating some cooked food “won’t kill me”. Of course it won’t, but while I am eating a certain amount of cooked food, I cannot eat the same amount of raw food. Why choose half of the stuff that your cells crave for, if you can have the 100% of it? Still on the physical level, you will realize that your digestion improves. One interesting effect of this which you may quickly be able to observe is that after a meal, you will not feel heavy and be tired. Why is it that people eating a standard diet sink into the well-known office sleep after lunch? Because their organism is overwhelmed with digestion work. If you want to be wide awake and vibrant in the afternoon, just eat plants, preferably raw. Thus you can get up from your lunch table and go on with your work without any pause needed. Be creative while others lie dormant! On another level, you will benefit from the absence of harmful vibrations coming from animal food. Meat, dairy or eggs that are stolen from dominated and exploited animals contain as by-products the fear and pain and frustration that they went through during their short lives. Even organic meat still contains on a vibrational level the horror of the slaughterhouse. As long as you are used to it, you are probably not aware of the effects of these negative vibrations on you. But once you have experienced a cleaner, healthier and lighter state of your body and mind, where this weight no longer keeps you down to the ground, you will understand just how heavy the vibrational burden has been before. Plant foods contain positive vibrations and these in themselves raise your own vibrations, according to the law of resonance. Think of this law of resonance as of a tuning fork which you hit on a surface and then put on your elbow, for example. You will feel the vibrations in your bones and it will make them start vibrate in the same frequency. It works exactly the same with your food instead of the tuning fork, you put it into your tummy and it makes you vibrate with the same frequency. This explains how the positive, higher vibrations of plants will help you feel better on the emotional level and become more spiritually evolved. For example, you may realize that you no longer suffer from nightmares. Or that you are less aggressive or more relaxed. Through its positive vibrations, your new food will raise your consciousness and make you become more aware of or confident in your intuitive wisdom. In other words, your spirituality increases and you will enhance your extrasensory capacities or develop new ones. Your intuition and openness are the key to what you will be able to draw from this. If you are reluctant to spiritual matters or do not “believe” in those, most likely you will not benefit from increased spiritual capacities. How could you if your mind is putting a brake on this? Did you ever try seeing auras, for example? You may then be able to do so. It takes no special training, just a high sensitivity and the intention to do it. Oh and yes, you will become much more sensitive in all sorts of domains. Almost certainly you will be able to feel energy emanating from other living beings, humans, animals, plants… I remember having bought a big box with organic apples and because they were so beautiful, I put my hands over the box: I could feel their energy! This was a wonderful experience. You may start feeling electricity (what I mean hereby is not what happens when you stick your finger into a power outlet…) and magnetic fields, even ultraviolet light, just to give some examples. All these capacities are a matter of increased sensitivity. When your sensitivity is no longer numbed by negative vibrations from animal food, it is as if a brake to your human potential is lifted: you will (re)discover your natural compassion toward all living beings and stand in awe before the wonders of this world. Your priorities in life may change, thus transforming your relationship toward beings and phenomena that you have taken for insignificant. Instead of exploiting Mother Earth, you may wish to protect and serve her. Now all these factors work together: a healthier body brings better brain function. In a perfectly functioning brain, creativity is increased. 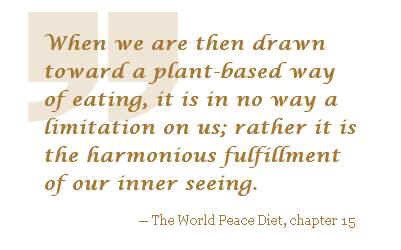 Positive vibrations in plant food (and absence of negative ones) raise spirituality. Spiritual development deepens intuitive understanding and awareness. Intuition boosts creativity. And so on. The interrelation between those different factors is the key. The food you are eating determines your capacities, physical and spiritual ones, and your way of thinking. By eating a vegan diet, you become healthier, more peaceful and more spiritual, and this will make you yearn to improve your diet and your general lifestyle even further. Voilà, our virtuous circle. Your whole system will be purified and enhanced, which results in a healthier body, a more effective mind, a spiritual connection with all that is and a better life. Develop your powers and unveil your true human potential – start right now!